Harry Potter has been a big part of my life since the books were originally published, and I love that Universal has carefully brought this story to life at the Wizarding World of Harry Potter at Universal Orlando. Getting to visit both Hogsmeade and Diagon Alley in one trip makes Universal Orlando one of my favorite Harry Potter experiences. 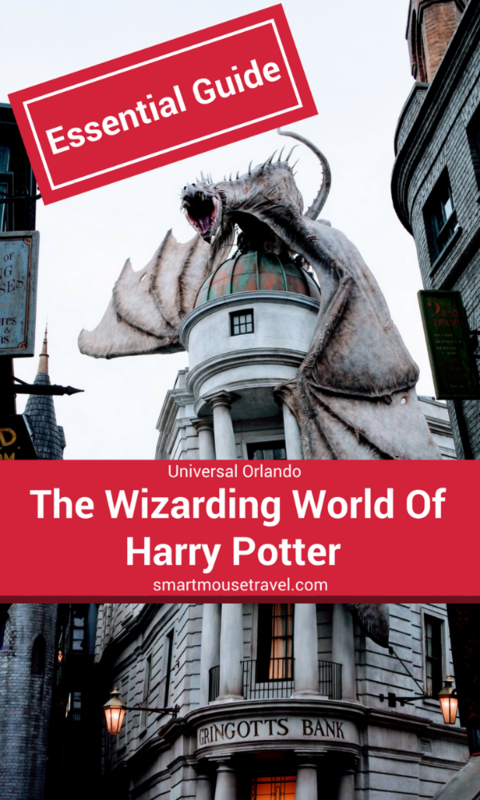 Find out more about everything to see and do at the Wizarding World of Harry Potter in Orlando. 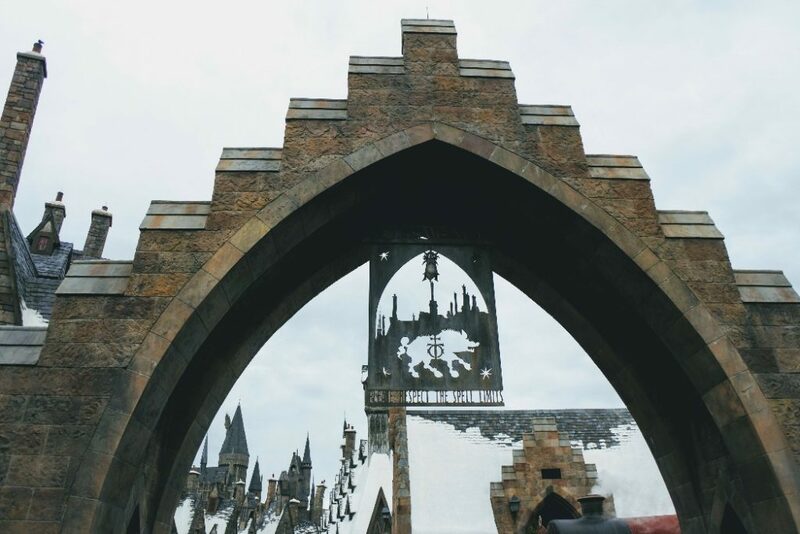 The first thing to know about the Wizarding World of Harry Potter in Orlando is that it is split among two different theme parks. Diagon Alley is found at Universal Studios Florida, and Hogsmeade is in Universal’s Islands of Adventure. Check here for more tips and tricks for your visit to the Wizarding World of Harry Potter Orlando. Harry Potter fans will know that Diagon Alley is a wizard shopping area accessed via the Leaky Cauldron in London. You enter Diagon Alley through an opening across the street from the Knight Bus and next to King’s Cross Station. When I walked into Diagon Alley the first time it took my breath away. Shops line the street and at the very end of the road is Gringotts Bank. This is where the iconic fire-breathing dragon is perched above the entrance to the bank. Although you have probably seen pictures, I assure you it is so different seeing the enormous Ukrainian Ironbelly in person. 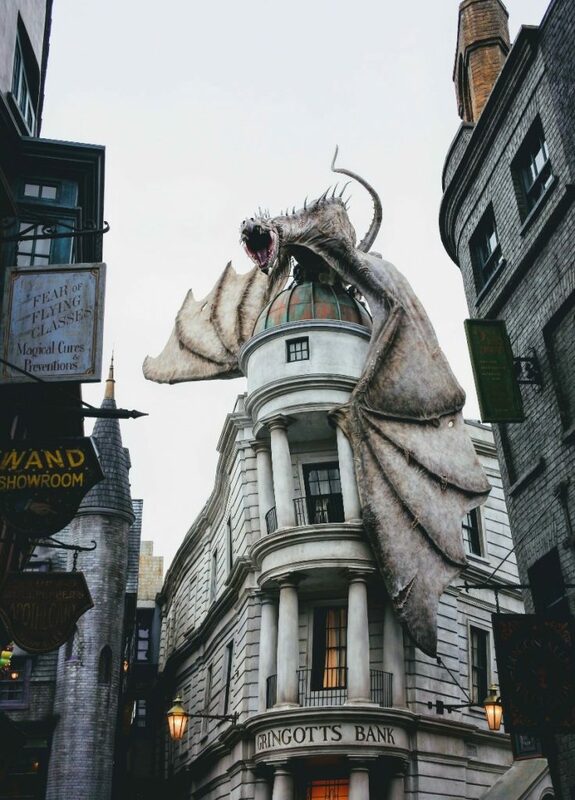 Pro tip: Stop and watch when the dragon above Gringotts breathes fire. It is a surreal experience and the fire feels hot even if you aren’t directly underneath. Harry Potter and the Escape from Gringotts combines 3-D screens and a mild roller coaster. This ride makes you feel like you are speeding through the underbelly of Gringotts Bank running from Voldemort, dragons, and trolls. We all really enjoy the ride, and I feel like it is less prone to cause motion sickness than The Forbidden Journey. In late summer 2017, Express Pass was added to Harry Potter and the Escape from Gringotts. This means those who are staying at certain resorts or who pay for Express Pass can skip the stand-by line. If you don’t have Express Pass you can either choose to wait in the traditional or single rider line. As usual, the single rider line allows you to access the ride more quickly, but your party may be separated. We usually do the traditional line if we don’t have Express Pass so we can go together. The outdoor queue area is quite boring with basic zig-zagging lines. However, once you enter the lobby of the bank there is so much to see. We love how lifelike the goblin bankers are as they work and speak to the crowd. Another important note is you can not bring a bag onto the ride. You need to use the lockers located in an area to the right of Escape From Gringotts. Just like our experience in Hollywood, the locker area can be extremely confusing. The lockers at Escape From Gringotts are different than those at Forbidden Journey. There are two locker sizes, small and large. The small lockers are provided at no charge, but the large lockers require payment. To use the large lockers at Escape From Gringotts you scan your park ticket at one of the locker stations. You will be asked to pay the locker fee with a credit card. Once you have completed the payment a locker will open. Store your belongings and then lock the locker. After your ride, scan your same park ticket to unlock the locker. You can also use cash, but that requires adding payment to your ticket at a cash pay box in the locker area before starting the above process. Find more information about the locker system here. Hogwarts Express takes you from King’s Cross Station at Universal Studios Florida and brings you to the Hogsmeade Station at Universal’s Islands of Adventure. What you see differs depending on which station you depart from. The train uses screens instead of windows to show the passing countryside and arrival at Hogwarts. On the reverse trip you see entertaining silliness thanks to Fred and George Weasley before arriving in London. During your train trip you can hear and see shadows of things outside your train compartment. It is really cool! To board the Hogwarts Express you must have a Park-to-Park pass which allows entry into both Universal Studios Florida and Universal’s Islands of Adventure on the same day. Before allowing you to enter the queue you must scan your pass and provide your fingerprint like you would for entering the park. You will likely be seated with another group in your train compartment if you are a smaller group. Learn from my mistake! We tried to ride to Hogsmeade and back near closing time of Universal’s Island of Adventure. The staff at Universal Studios Florida (King’s Cross) said we should make it there and back no problem. We arrived right at 8pm (closing time for Islands of Adventure) and tried to rejoin the queue at 8:01pm. The staff turned us away and we had to exit the park. By the time we made our way fully out of Islands of Adventure it was too late to go back to Universal Studios Florida. 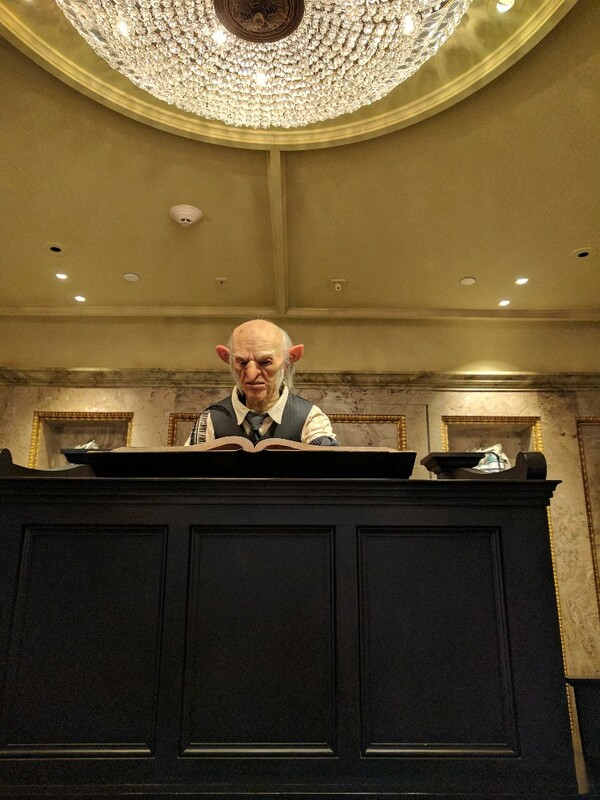 Here you will find an animatronic goblin (similar to the ones in the queue of Escape From Gringotts) that will explain wizard money to you. It was fun to see how lifelike the goblin was and get a refresher course on how many sickles to a galleon, etc. You may turn your muggle money into paper wizard money that can be used within Diagon Alley, but we chose not to convert our money. This shop has a large selection of Hogwarts house robes, costumes and accessories. This is the shop where Elizabeth got her Gryffindor robe and matching headband. Make sure to see how you look in the antique mirror – it talks! Here you can see a wand choose a wizard in this short interactive show. One person from each group is chosen to have a wand fitting just like the experience at Universal Hollywood. 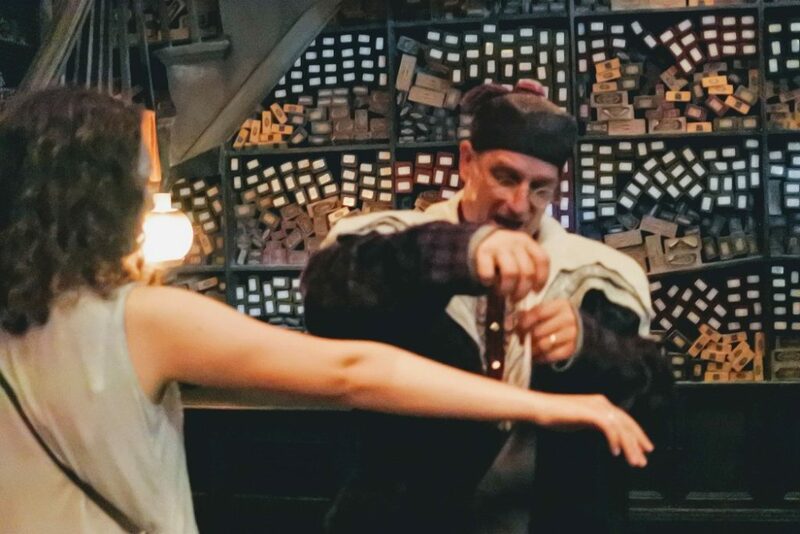 The Ollivander’s staff make this a fun, interactive experience, and we go to Ollivander’s on almost every trip. After watching the fitting you will be ushered into the shop where your wand may choose you. Important notes: Elizabeth’s wand from Universal Hollywood did work on the windows in Orlando, but we did not have proper maps for Diagon Alley or the Universal Orlando Hogsmeade. 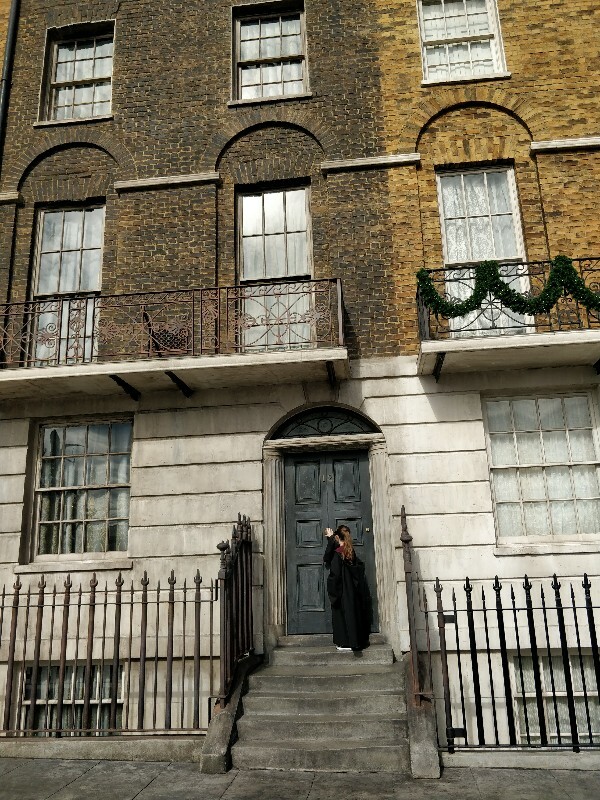 We walked around Diagon Alley looking for the bronze medallions set in the ground to find spots to perform magic (which was still fun), but I’m sure we missed some places that first time. I later caved and bought a second interactive wand so we could do all of the “magic” with a proper map. Pro tip: Make sure you take a wrong turn down Knockturn Alley to find some spots to perform magic in this dark wizard haven. Find some of Fred and George’s popular creations in this shop including Pygmy Puffs and Skiving Snackboxes among other items. Just like the books suggest this wizard dive bar provides a decent meal in a none too fancy setting. Long tables line the main hall and it’s fun to look for wanted posters of Sirius Black during your meal. Make sure you notice the actual leaky cauldron in the fireplace, too! You order and pay at a cashier who will give you a table number. Take this number to the seating area and staff will direct you to a table. Your food will be brought out to you when it is ready. The cottage pie is a family favorite and Elizabeth swears the grilled chicken is amazing. You may remember Harry spending a lot of time at this Diagon Alley ice cream spot before school started in The Prisoner of Azkaban. Now is your chance to have some soft-serve or hard pack ice cream on a hot day. Or in my opinion, any day is a good day for ice cream. This shop sells non-alcoholic wizarding drinks such as Butterbeer, Pumpkin Juice and Otter Fizzy Orange Juice. The Hopping Pot is a walk up kiosk offering both alcoholic and non-alcoholic wizard beverages and some snacks. Before you even enter into Diagon Alley you can see the Knight Bus which provides safe transport to wizards in need. In fact, it transported Harry to Diagon Alley in The Prisoner of Azkaban. 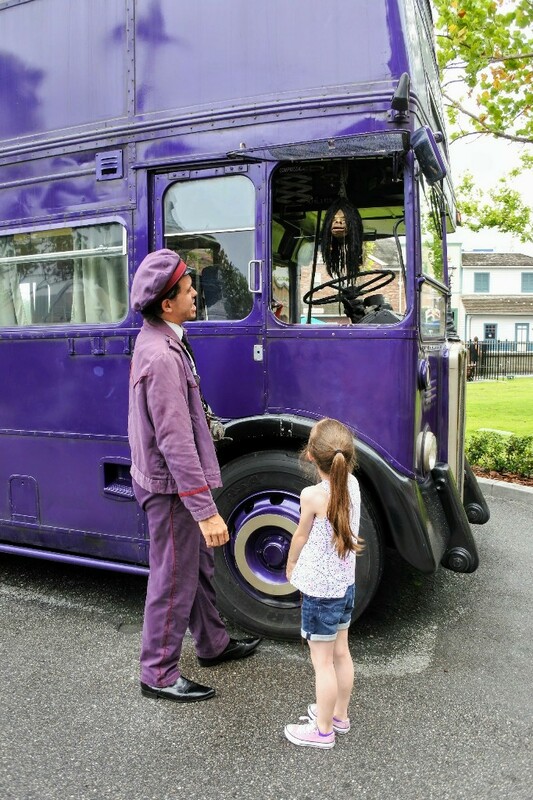 You can admire the garish purple bus from afar or wait to speak to Stan, the conductor of the Knight Bus. We, of course, waited to see Stan. On one of our visits, Stan (and the shrunken head inside the bus) asked Elizabeth about being such a young witch. They inquired how many people she had turned into toads so far. When she replied none, Stan and the shrunken head decided she must like to turn people into pigeons instead. They kept asking if pigeons around us were people she had turned. This made us all giggle. Fans of Harry Potter may remember the Order of the Phoenix headquarters at Sirius Black’s home, 12 Grimmauld Place. Just to the right side of the Diagon Alley entrance you can see the slightly dilapidated home. Make sure you watch the windows closely. Kreacher, the house elf, peeks out from behind the curtain of the window just above the door every couple of minutes. He doesn’t look very happy to see muggles and mudbloods milling around just outside his home. 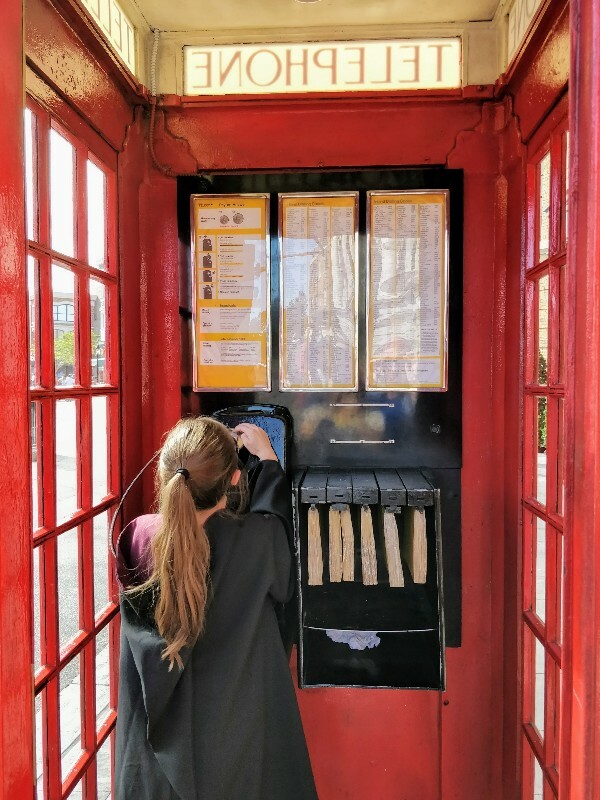 If you remember, one of the entrances into the Ministry of Magic is located inside an innocuous looking phone booth in London. Dial “62442” to hear a message from the Ministry. Those of you familiar with the books or movies will know Hogsmeade is the little town located near Hogwarts School of Witchcraft and Wizardry. I love walking into Hogsmeade with its snow covered roofs and quaint shops. It is fun to imagine Harry, Ron and Hermione wandering through the town on weekend visits. Harry Potter And The Forbidden Journey is a ride that takes you flying around the Hogwarts’ grounds. This ride mixes 3D screens, animatronics and a unique hydraulic arm to move you through the ride track. You will encounter animatronic Aragog and his spider family, many large dementors, the Whomping Willow and more on this ride. The large scale animatronics make this ride scary for those who are easily frightened. If you are prone to motion sickness this ride may make you feel green. I am moderately sensitive, but am okay after one ride. A second back to back ride makes me feel off. The wonderfully themed queue is one of my favorite things about Forbidden Journey. You will have plenty of time to enjoy the details in the regular queue, but even the Express Pass line lets you admire some of the details. This ride also requires you to store your bag in a locker. The locker system can be quite stressful if you aren’t prepared. You will find the lockers off to the right side when you enter Hogwarts to join the ride queue. The lockers are surprisingly complicated, so be sure to check out my step-by-step guide to using the lockers at the Wizarding World. This is a small, family friendly roller coaster located in Hogsmeade. It takes you on a short ride past a Hippogriff and Hagrid’s hut. Although fun, the ride itself is quite short. I would not recommend waiting in a long line for Flight Of The Hippogriff. The good news is it does have an Express Pass line which will allow you to skip the line. 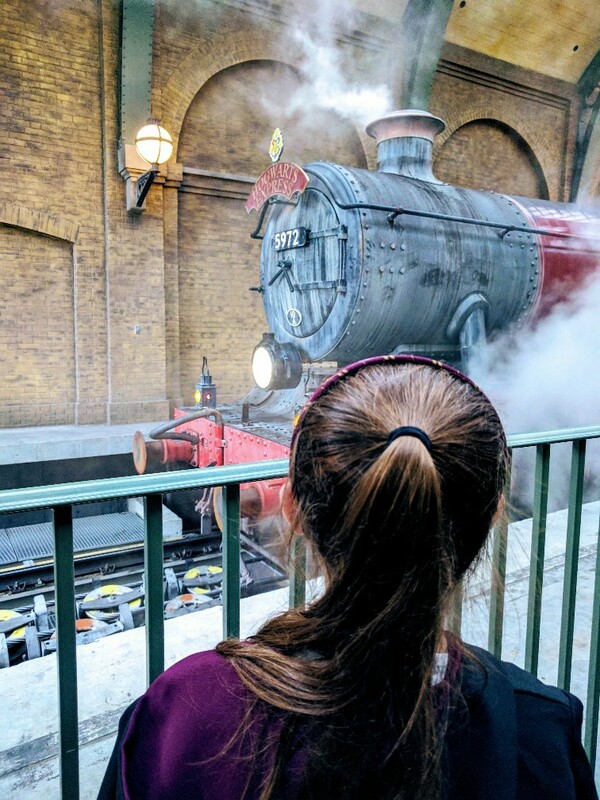 The Hogwarts Express takes you from the Hogsmeade Station at Universal’s Islands of Adventure and brings you to King’s Cross Station at Universal Studios Florida. What you see differs depending on which station you depart from. Therefore it is ideal to take the train from each station at least once. This sweet shop is heavily featured in the Harry Potter books and movies. 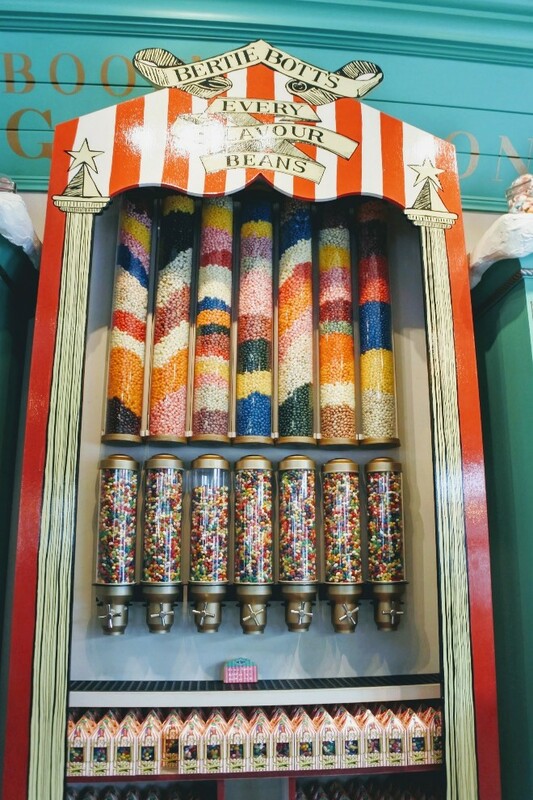 Get your fill of Bertie Bott’s Every Flavour Beans, Chocolate Frogs or Exploding Bon Bons inside this colorful candy store. If you are starting your trip by visiting Hogsmeade or didn’t get a chance to purchase your wand in Diagon Alley stop by the Ollivander’s in Hogsmeade. Here you can expect the same brief interactive wand fitting and then choose from dozens of wands. 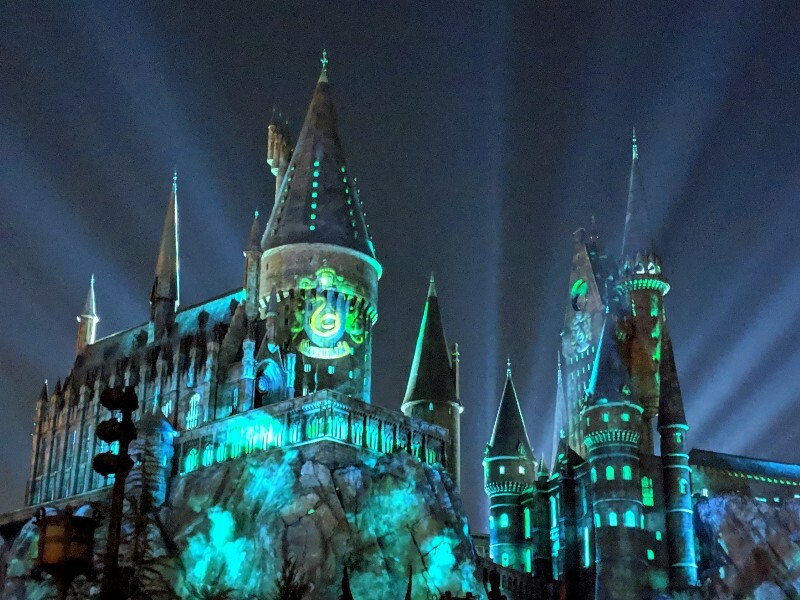 This light projection show features the sorting hat as a narrator and shows images of all four Hogwarts houses: Gryffindor, Hufflepuff, Ravenclaw, and Slytherin. Nighttime Lights at Hogwarts Castle takes place every few minutes from dusk until park close. The show is only a couple of minutes long, but is worth taking time to watch. The castle light projections and blast of fireworks at the end is breathtaking. If you are at the Wizarding World Of Harry Potter during Christmas time you will see a different castle projection show. Find out more here. Pro tip: We liked watching the show from the stage area across from Hogwarts. The kids were able to stand up on the stage and have an unobstructed view of the castle. In the Harry Potter books and movies Professor Flitwick directs the Frog Choir. 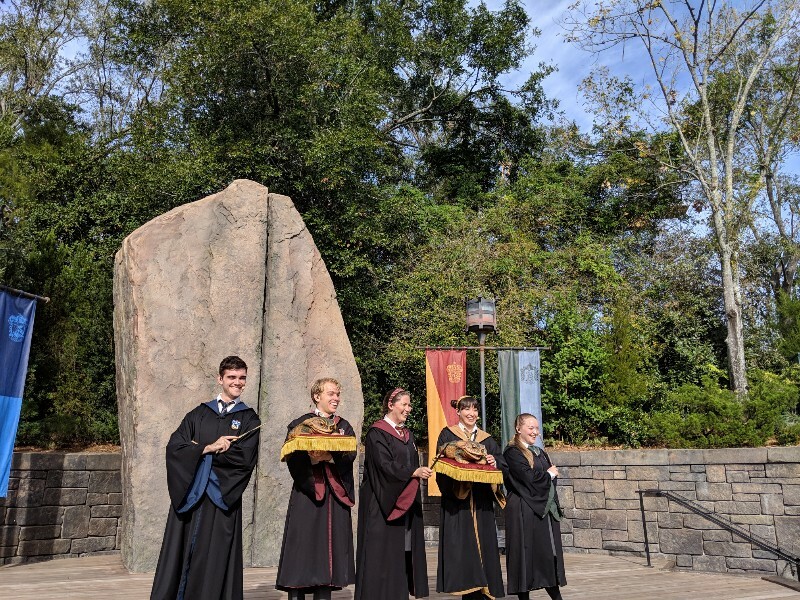 Here at Universal Orlando students from the four houses sing several songs together on the stage across from Hogwarts Castle. A couple students even have their trusty frogs to sing along with the choir. Students from Hogwarts, Beaubaton, and Durmstrang show off their impressive skills to get everyone excited for the Triwizard Tournament. The show is a mix of dance and martial arts moves that is fun to watch while in Hosmeade. This show alternates with the Frog Choir on the same stage. 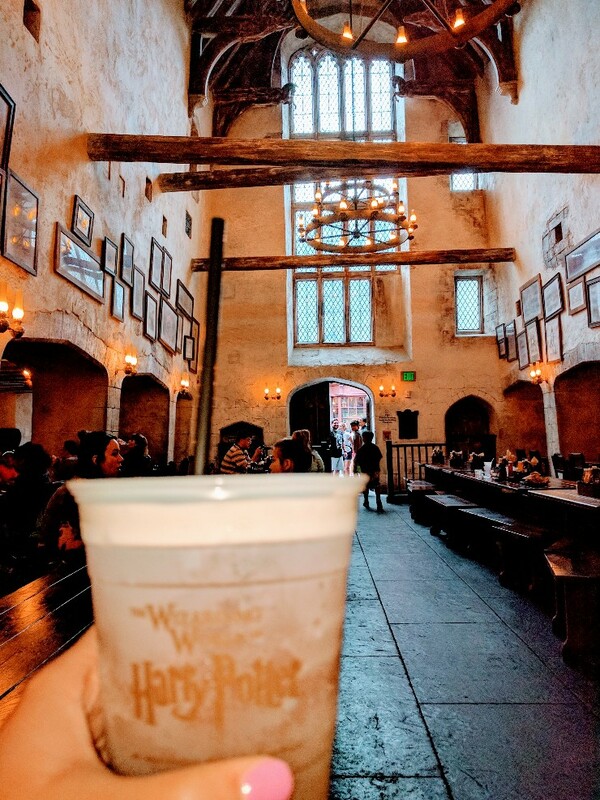 Located next door to Three Broomsticks, Hog’s Head Pub can provide you some Butterbeer, Pumpkin Juice or even beer, wine or specialty drinks while you explore Hogsmeade. This restaurant is a quick service type atmosphere. You place your order with a cashier and are then told to wait by a numbered pick up window. Once you have your order you are directed to an open table by staff. The staff was helpful in answering my questions regarding Elizabeth’s food allergy and made a substitution to accommodate the allergy. Elizabeth and I are usually able to share a rotisserie smoked chicken entree. This entree provides a full half chicken for our meal plus two sides. My mom generally opts for a healthy chicken salad which is large enough she can share some with me and still be stuffed. 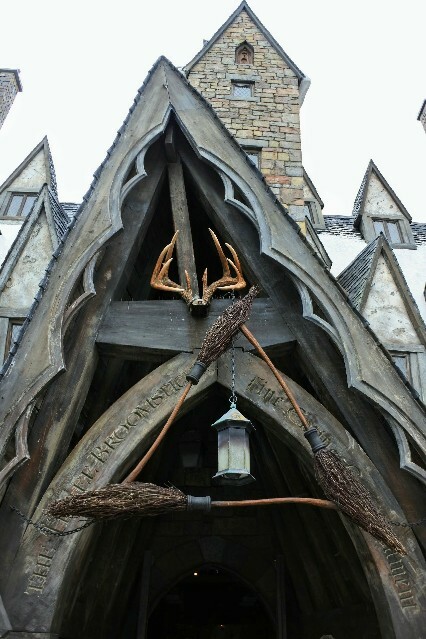 We really enjoy our meals at Three Broomsticks. The quality of food is good and the portions are generous enough to make sharing possible. 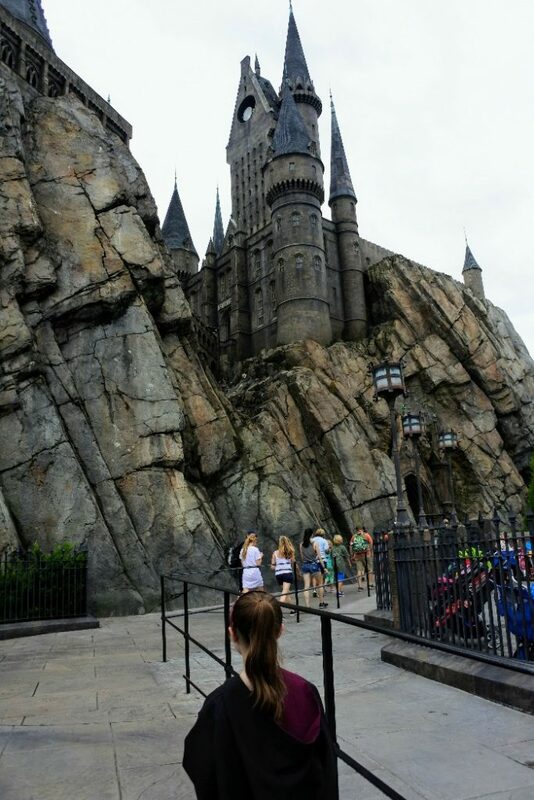 We absolutely love our time in The Wizarding World Of Harry Potter at Universal Orlando. 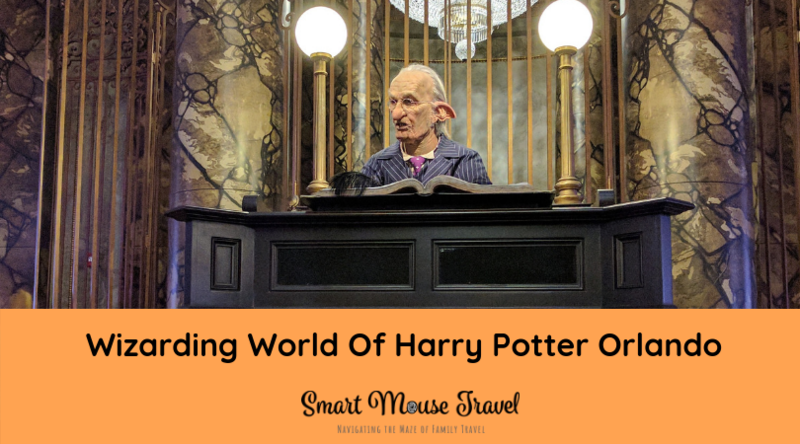 The ability to immerse yourself in the wizard world experience is so much fun for those who are big fans of the Harry Potter books. Even if you are not the biggest Harry Potter fan the attention to detail and beauty of both Diagon Alley and Hogsmeade will still entertain you. Here are even more tips and tricks for visiting The Wizarding World of Harry Potter at Universal Orlando! Enjoy! 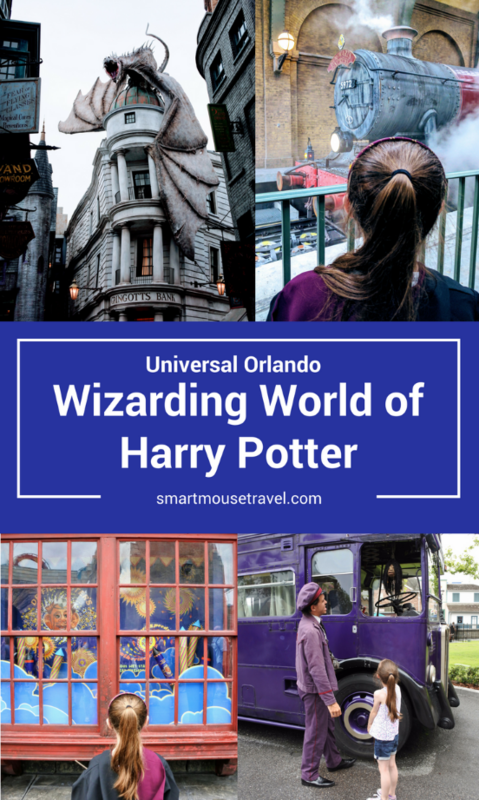 We stayed at Loews Portofino Bay Hotel when visiting Harry Potter at Universal Orlando. Read my complete review of the property here. I struggled with motion sickness on Forbidden Journey, but the view of the inside of the castle is worth waiting in line with the rest of our group. There is a nice child swap/sicky area to wait for the others to finish. I did not have trouble on Escape From Gringotts. I made sure not to ride back to back just to be safe. Thank you for sharing your experience! I’m sure this information will be helpful for others. I loved the HP books and how cool to see it all come alive. I would probably need to re-read the books I forget the story! I want to do this book as a read aloud with the kids. Might be a good project for the winter. Then we can go visit this attraction! what month did you visit universal. We are planning to go and your pictures look like the park was not as crowded at the time.